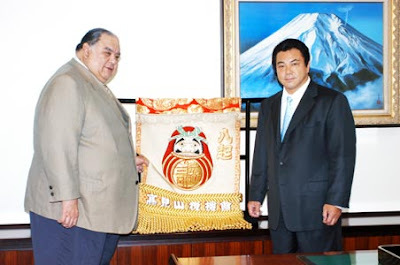 Takamiyama, a famous sumo wrestler in his time, was in the news today and a Daruma keshomawashi was in the background of the photo. He will retire in June from his job as OYAKATA. In sumo, a mawashi (Japanese: 廻し) is the belt that the rikishi (or sumo wrestler) wears during training or in competition. 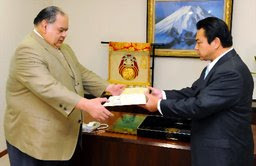 Upper ranked professional wrestlers wear a kesho-mawashi (see below) as part of the ring entry ceremony or dohyo-iri. For top, sekitori, ranked professional rikishi it is made of silk and comes in a variety of colors. It is approximately 30 feet (9.1 m) in length when unwrapped, about two feet wide and weighs between eight and eleven pounds. It is wrapped several times around the rikishi and fastened in the back by a large knot. A series of matching colour, stiffened silk fronds, called sagari are inserted into the front of the mawashi. Their number varies from 13 to 25, and is always an odd number. 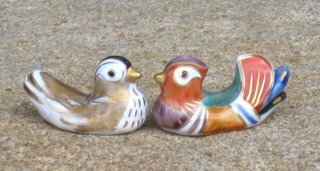 If these fall out during competition the gyoji (or referee) will throw them from the ring at the first opportunity.
. . . CLICK here for Photos of sumo wrestlers belts! (born 16 June 1944 as Jesse James Wailani Kuhaulua in Hawaii, U.S.) is a former sumo wrestler, the first foreign born rikishi to win the top division championship (in 1972). His highest rank was sekiwake. He is also the first foreign born wrestler ever to take charge of a training stable, having been head coach of Azumazeki stable since 1986. In my very first year in Japan, a friend invited us to her home for lunch. Over the sofa was a large painting of a man. "Oh, you have an ink painting of Daruma san!" I was happy to have found a soulmate. She laughed out loud. "Gabi san, you are the first to recognize this painting. 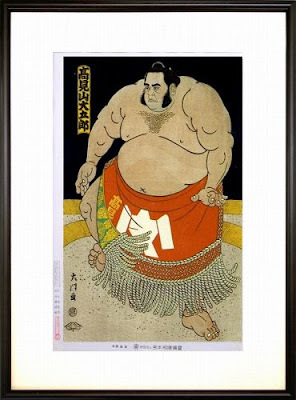 Everybody else says: Is this Takamiyama, the famous sumo wrestler?" We had a good laugh and ever since Takamiyama, who was at his best at that time, has been like a Daruma to me. 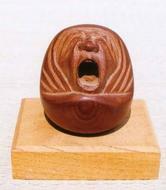 I am happy to find his Daruma Mawashi today in the news. Delightfully built on Basho's wonderful original. I like this very much, Gabi.